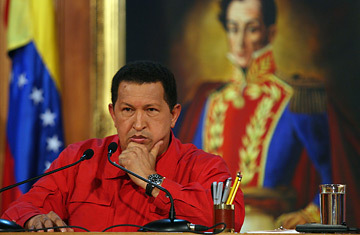 Hugo Chavez looks on after hearing election results. Chavez: A Democratator in Venezuela? Venezuelan President Hugo Chavez's left-wing, oil-fueled revolution usually carries itself like a swaggering, cocksure juggernaut. So it was a sign that things perhaps weren't looking good for the fiery, anti-U.S. leader Sunday night when he didn't appear on the balcony of Miraflores, the Caracas presidential palace, pumping his fists and crowing confidently about victory. Venezuela's polls had closed in a national referendum on a raft of constitutional reforms that would have profoundly tightened his hold on political power in Venezuela  including an amendment to eliminate presidential term limits (which currently last six years). Instead, Chavez's Vice President, Jorge Rodriguez, appeared as the night wore on and told reporters, "We will respect the result, whatever it is." And, to the astonishment of his opponents, Chavez did. At around 2 a.m. this morning, Caracas time, Chavez conceded his first electoral defeat since winning Venezuela's presidency in 1998. After facing an unusually strong protest movement on the streets of Venezuela's major cities  led not by traditional opposition figures but by university students who'd grown fearful that Chavez was moving the country toward a Cuba-style dictatorship  his reforms were narrowly beaten back by a 51% to 49% margin. The result, and Chavez's graceful acceptance of it, may well have set not only Venezuela, a key U.S. oil supplier, but all of Latin America on a far surer path to democracy in the 21st century. "This was a photo finish," Chavez told his stunned backers after his defeat was announced. "Don't feel sad, don't feel burdened." Only about half of Venezuela's 16 million registered voters showed up at the polls on Sunday. Low turnout was supposed to have hurt the opposition's "no" vote; but in the end it was Chavez, thought to have a reliable populist political machine at his disposal to get out the "yes" vote, who couldn't rouse his base among Venezuela's majority poor. Even that cohort, despite having benefited from Chavez's vast socialist project, backed away from his bid to solidify "21st-century socialism," which also would have put the autonomous Central Bank under his control and exerted deeper federal authority over local and state governments. Given the fact that Venezuela's National Assembly and Supreme Court are already Chavez's rubber stamps, those issues seem to have overridden the economic carrots Chavez's reform package held out, like expanded social security benefits and shorter working hours (from 8 to 6 hours each day). Venezuelans also appear to have told Chavez and his Bolivarian Revolution (named for South America's 19th-century independence hero, Simon Bolivar) that despite the country's enjoying the fruits of record oil prices  the country has the hemisphere's largest oil reserves  they're fatigued by almost a decade of polarizing revolutionary rule and would like to return to some normalcy. "This is a country divided in two," said Stalin Gonzalez, a student at the Central University of Venezuela in Caracas. "There's a part that loves Chavez and a part that hates him. A middle ground is lacking. We won't build a country that way." The movement led by Gonzalez and tens of thousands of fellow students proved decisive: They articulated an opposition message and galvanized its sympathizers far more effectively than Venezuela's older political elite ever could. It was a force Chavez had not planned on reckoning with, particularly since students have long been a bloc that Latin America's political left could depend on. Chavez also couldn't withstand the defections within his own bloc, including socialist state Governors and, perhaps most important, his erstwhile pal and former Defense Minister, Raul Baduel, who earlier this month called Chavez's amendments a "constitutional coup d'etat." The attempt by Chavez and his backers to demonize figures like Baduel  labeling them "traitors"  backfired, especially since Baduel had helped put Chavez back in power after a botched opposition coup attempt against him in 2002. But just as important was Chavez's concession. The opposition "won this victory for themselves," he admitted in a voice whose subdued calm was in contrast to his frequently aggressive political speeches. "My sincere recommendation is that they learn how to handle it." Despite his authoritarian bent, Chavez (whose current and apparently last term ends in 2012) had always insisted he was a democrat  that he was, in fact, forging "a more genuine democracy" in a nation that had in many ways been a sham democracy typical of a number of Latin American countries. His presidential election victories  in 1998, 2000 and 2006, as well as his victory over an attempt to recall him in a 2004 referendum  were all recognized by credible international observers; and that conferred on him a democratic legitimacy that helped blunt accusations by his enemies, especially the U.S., that he was a would-be dictator in the mold of Fidel Castro. In the end it was a cachet that, fortunately, he knew he couldn't forfeit. As a result, the referendum result will resonate far beyond Venezuela. Latin Americans in general have grown disillusioned by democratic institutions  particularly their failure to solve the region's gaping inequality and frightening insecurity  and many observers fear that Latin Americans, as they so often have in their history, are again willing to give leaders like Chavez inordinate, and inordinately protracted, powers. Chavez, critics complained, was in fact leading a trend of what some called "democratators"  democratically elected dictators. His allies in Bolivia and Ecuador, for example, are hammering out new Constitutions that may give them unlimited presidential reelection. The fact that Venezuelans this morning resisted that urge  and that Chavez so maturely backed off himself when he saw it  may give other countries pause for thought as well. It could even revive the oft-ridiculed notion that this might after all be the century of the Americas.